Why do customers stand right next to the person you're helping instead of getting in line? When it comes to lines, there are typically two types of "line jumpers" - the Thinkers and the Thoughtless. 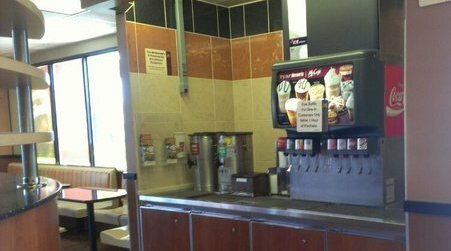 Before self serve beverages were a thing, it was a common occurrence in places like McDonald's for customers to stand to the side of the line for a refill rather than rejoining a line. The same phenomenon happens in libraries. Although customers may not need a top off, they may deem their question to be a quick encounter and not intrusive. How customers come to that conclusion has a lot to do with deductive reasoning. 3: Therefore, this is not the line for me. Once a customer has deduced that this line is not applicable to him/her, he/she may seek out another staff member on the floor or, as established, form their own line. This action may be a nuisance to the staff member and the customer being helped, but the logic is sound based on perceptions and opinion. At this point, you may signal for the interrupting customer (or Thinker) to proceed or they may just ask the question once you've acknowledged their presence. Or, as I used to do, perhaps you do not engage the customer in conversation at all and let them wait until the transaction is finished. While I do not recommend cutting off the person you are helping to refocus on another customer, there is some middle ground that can be gained. A customer bypasses line and walks to reference desk. After the current customer has explained what he is looking for, you pause to look up books on his subject. Seeing the Thinker to the left of the customer, you address him. Staff: "I'll be with you in just a moment." Thinker: "I just have a quick question - where is the Christian Fiction section?" The staff member is in a bind! This customer has a seemingly harmless directional question but the staff member's training has told her that pointing is never a good idea and that follow-up questions are key to quality customer service. So what would you do? Often, customers with 'quick' questions are looking for both quick answers and quality customer service. It may seem hard to deliver both, but with effort it can be done. where you'll find Christian Fiction. If you have trouble finding it, let me know." What you've done by giving this response is providing a quick answer along with the reassurance that you want to help. Once the customer walks away, however, it is important to remember the follow-up. Once you get through your line, head out to look for the customer to make sure they've found everything or send another staff member in your place. The follow-up will ensure that your Thinker got the same customer service as all your other customers. We've all experienced those people who just don't have time to wait in line - those who think the world revolves around them. Often times, the Thoughtless are just Thinkers with bad attitudes, but occasionally you may get a real doozy. Thoughtless customers are often customers you have helped before that habitually interrupt you when you are assisting others. Sometimes they are nice people who just need a little direction and sometimes they have not-so-pleasant personalities. 1. This line is for customers with new questions. 2. My question is a continuation from my previous question. 3. Therefore, this line is not for me. Basically, in the customer's eyes, the transaction was never completed - and it will not be completed until they are entirely satisfied. Although it may mean an occasional interruption, this type of customer will be willing to wait for your excellent customer service. The Thoughtless customer who comes across as rude or, sometimes, downright hostile is a rare occasion which requires a different approach - empathy. But we'll save that for another post and another staff member question - Why did they just throw a book at me?